Grande Vitesse Systems, GVS, Nomadic, Metropolis, Re:View Manager, GVS MAM, Starnet, and GVS 9000 are trademarks or registered trademarks of Grande Vitesse Systems Systems Inc., in the United States and/or in other countries. All other brands, products, or service names are or may be trademarks or service marks of, and are used to identify, products or services of their respective owners. Although Grande Vitesse Systems (GVS) has attempted to provide accurate information on the Web Site, GVS assumes no responsibility for the accuracy of the information. 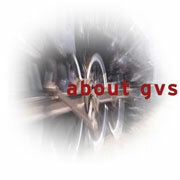 GVS may change the programs or products mentioned at any time without notice. Mention of non-GVS products or services is for information purposes only and constitutes neither an endorsement nor a recommendation. All information provided on this web site is provided "as is" with all faults without warranty of any kind, either expressed or implied. gvs and its suppliers disclaim all warranties, expressed or implied including, without limitation, those of merchantability, fitness for a particular purpose and noninfringement or arising from a course of dealing, usage, or trade practice. Grande Vitesse Systems and its suppliers shall not be liable for any indirect, special, consequential, or incidental damages including, without limitation, lost profits or revenues, costs of replacement goods, loss or damage to data arising out of the use or inability to use this site or any GVS product, damages resulting from use of or reliance on the information present, even if GVS or its suppliers have beenadvised of the possibility of such damages.